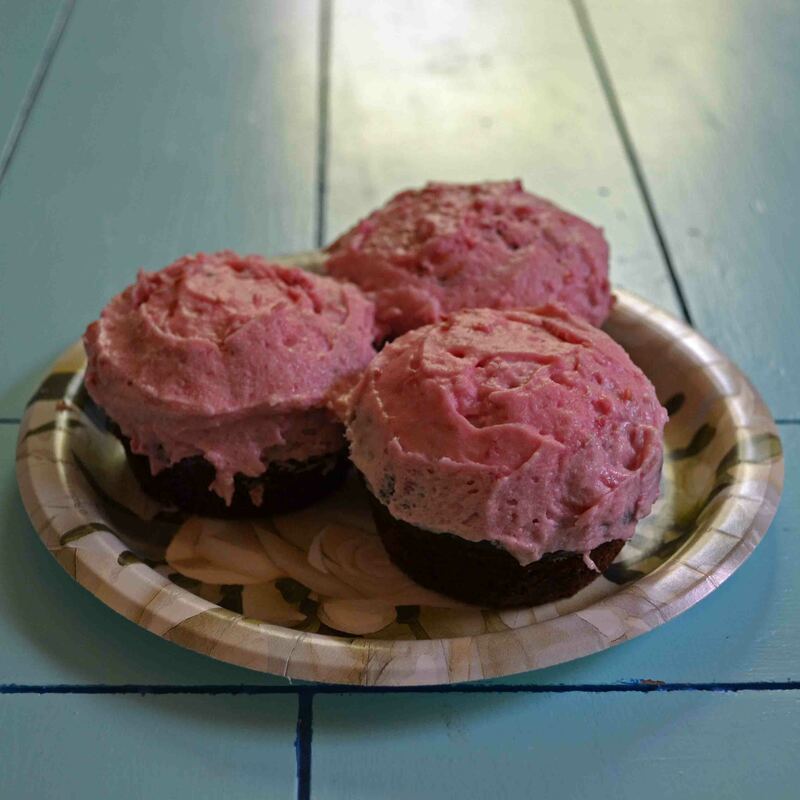 These chocolate cupcakes with raspberry frosting are completely irresistible! One of my favorite flavor combinations of all time is raspberry and chocolate. It’s absolutely the best: the sweet/tart of raspberry with the rich smoothness of chocolate (especially dark) cannot be beat. So when it came time to make cupcakes for my birthday, the choice was obvious! I made chocolate cupcakes with a raspberry cheesecake buttercream icing. All the ingredients laid out so you don’t forget anything. Butter, sugar, eggs. The basics. Start the frosting while they cool! 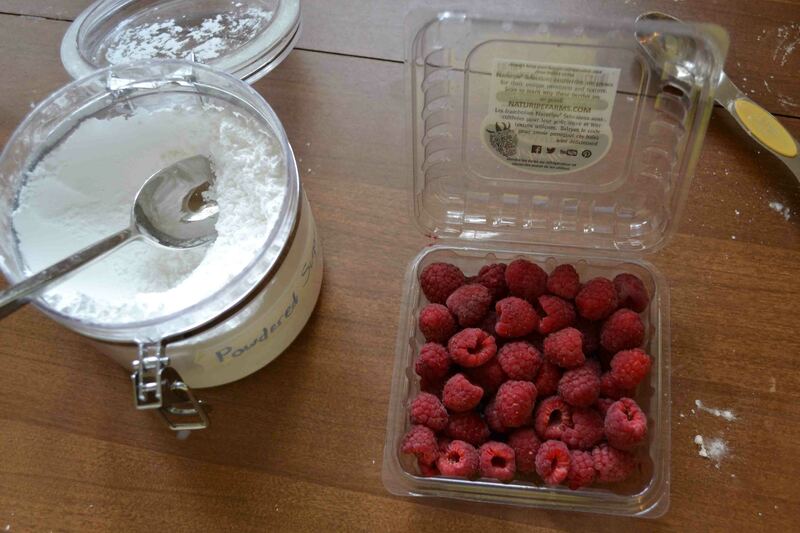 Raspberries and powdered sugar = delicious. Already looks good – it was hard not to keep sampling as I cooked. Finished icing, already chilled and ready to use. Look how appetizing those look! This recipe made a TON of cupcakes, maybe 33. I gave them away for days afterwards, because I have no self-control when it comes to baked goods sitting in my kitchen. I based the recipe on this blog with my own personalized touches of course. Preheat the oven to 350º. Grease muffin tins with cooking spray or butter. 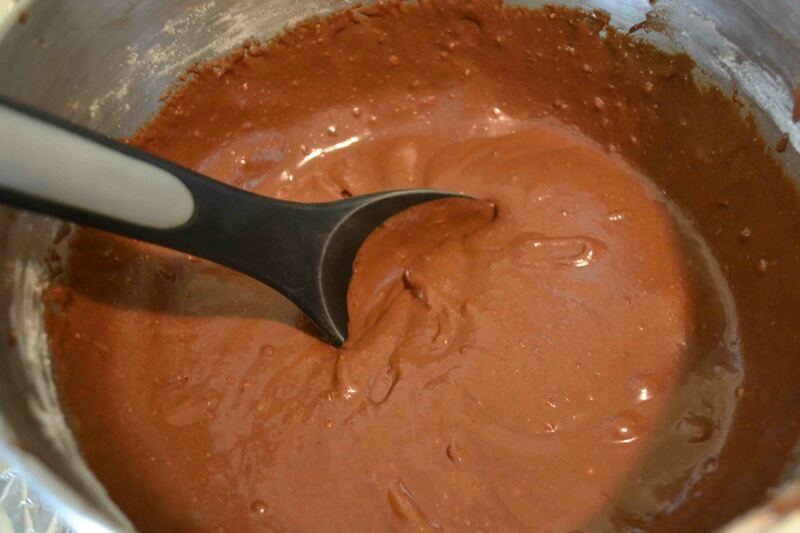 Melt chocolate in the microwave in 15 second intervals and stir in between to heat evenly. Once melted, set aside to cool. Sift together flours, cocoa powder, baking soda, baking powder, and salt. Set aside for later. 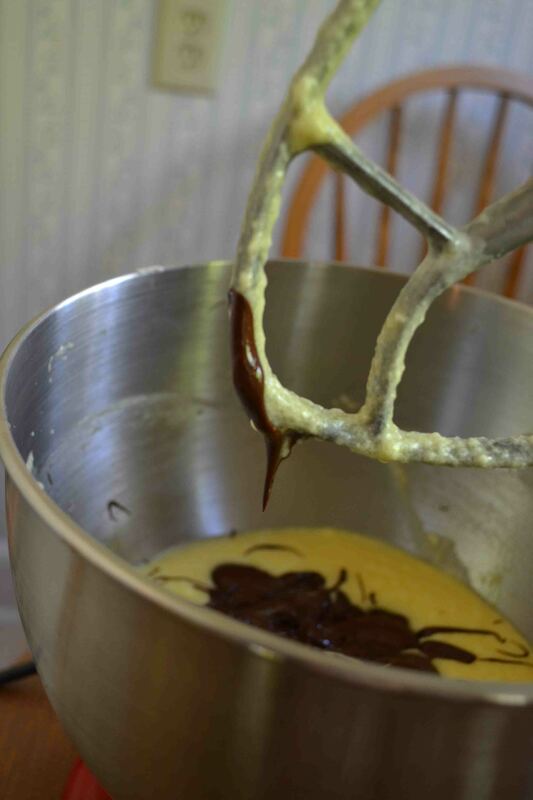 In a mixing bowl, beat eggs and sugar for 5 minutes. It’s done when it’s thickened and paler than it started. Mix in butter. Add in melted chocolate. Once combined, add yogurt and vanilla and beat. It’ll look soupy. Alternate adding in flour and milks and beat until fully combined. Let it sit for 5 minutes, then put into muffin tins. Cook for 18-22 minutes, until a toothpick in the center is clean. Let cool on a rack completely before icing. Cream butter and cream cheese for 1-2 minutes until fluffy. Add 1 cup powdered sugar and beat until smooth. 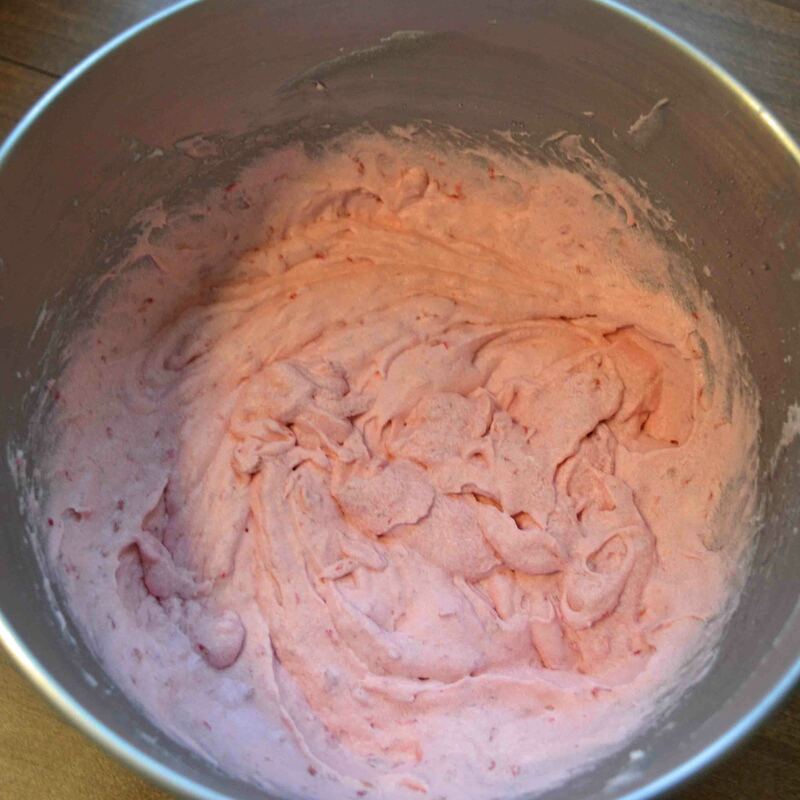 Add half the raspberries and mix until color is even. Add 3 more cups powdered sugar, 1/2 cup at a time. 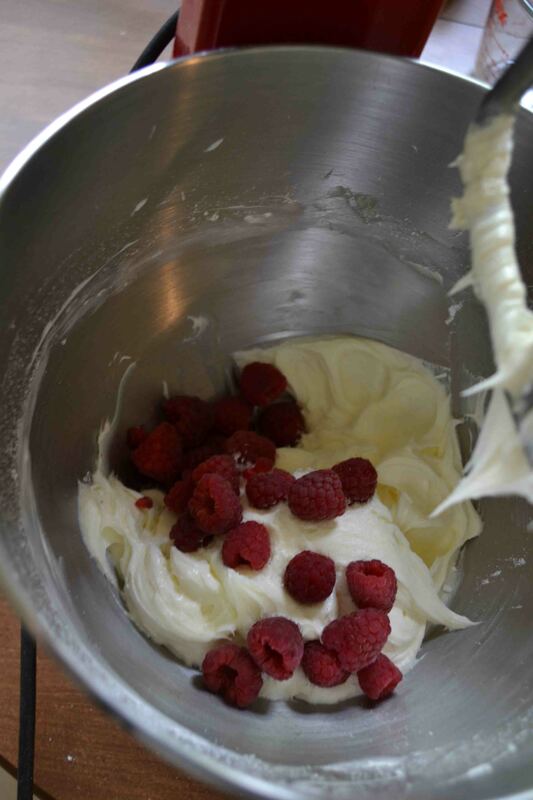 Add vanilla and rest of the raspberries. Mix at medium-high until light and fluffy. Add more powdered sugar as needed to get the consistency what you want. Chill the icing for at least 30 minutes – this helps it hold shape when you frost the cupcakes.